Report parameters are correct and descriptions for each report are available. To ensure the correct layout and format for the reports, be sure Adobe Acrobat is the latest version 9.2.0. Receiving state users assigned to a case that includes a Notice of Arrival (or a legacy case) has the option to submit a Case Closure Notice. The option to change the supervision end date is available to the assigned user for accepted outgoing cases. This includes all users in the bifurcated states below. An In-service training session on the reporting capabilities of ICOTS is open to attendees of the ICAOS Annual Business Meeting, November 2-4, 2009 in Reno, Nevada. Searching for an offender using the Compact Workload limits results to offenders associated to you and your state. Be sure to perform the “print all” prior to submitting or consenting to any merge or delete request in ICOTS. ICOTS and the National Office only preserve the audit trail of who performed the action, not the data altered. 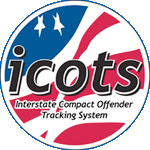 Merging two offender records does not merge the ICOTS cases associated with each offender ID. Remove cases from the active workload by withdrawing or submitting a Case Closure Notice. In addition to the published list of bifurcated states below, other states such as Texas, Colorado and Pennsylvania have bifurcated operations within their state. These states may require dual supervision cases to be entered separately so that those cases can be appropriately assigned to users within their states.